This is one of my favourite Eremophilas. The leaves are grey green and are softly furry which can be seen closeup to the plant (hence the variety name ‘tomentosa’). A microscope would give an even more dramatic view. With the bright red flowers for contrast it is a great bird attracting plant. This is a plant for a dry position and well drained soil. It is about one and a half metres tall by about half a metre wide. It needs to be pruned after flowering to promote more new growth which of course produces more flowers. 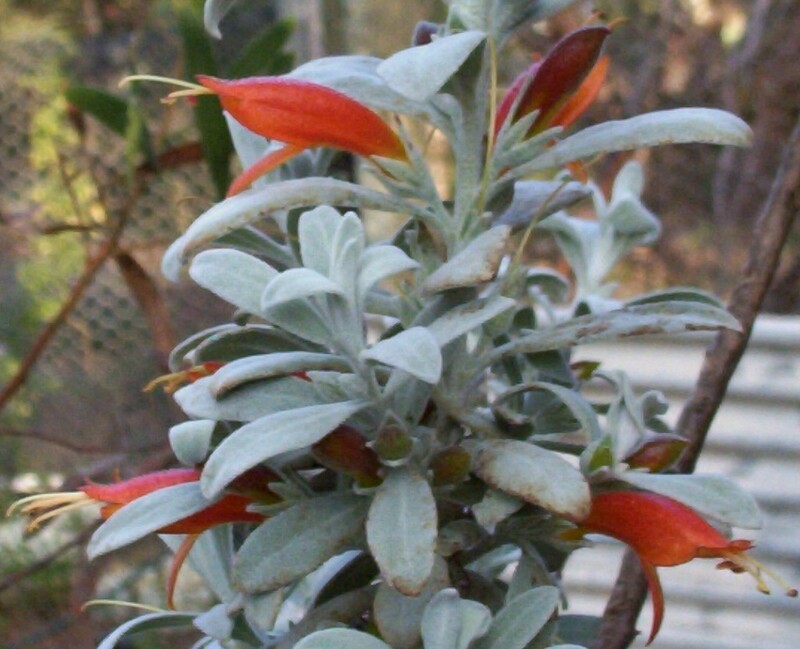 There are a number of Eremophilas which come into the category of ‘glabra’, and a few others which have grey or whitish foliage with green, yellow, orange/red flowers. No. This is the natural colour of the leaves.